The whole composition bases on a recording captured August 25th 2010 at 11:56 pm in the village Paitzdorf (Thueringia). Around the clock, combines are permanently in service on the surrounding agricultural areas at harvest time. 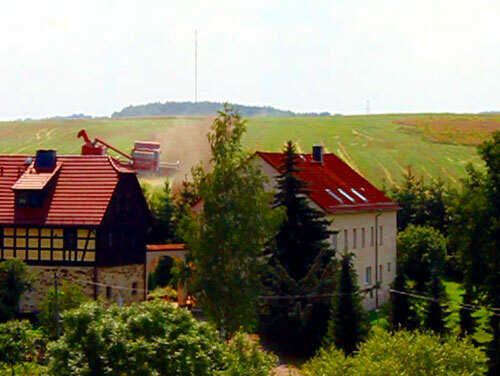 The small village is situated in a sag and the harvesters are working slidely distant on the nocturnal cornfields. The recording is uncut and not allocated with other effects – but accompanied by a female voice. In the first part she is humming and hissing very quietly, followed by a boost of volume in the middle part – she doubles, quadruples, singing different pitches, sounds and glissandi – words like “Mitternacht” (midnight) and “Sommernacht” (summer-night) appear. Suddenly the clock strikes twelve times and the voices cease. Only at the very end they join in a sequence of dissonance. This work is part of a whole cycle, called „Folgelandschaft“ (follow-up landscape) and deals with the region as Ex. Uranium-mining-area.